Boek: Pierre Marie Arthur Morelet (1809-1892) and his contributions to malacology - Geschreven door Breure, A.S.H., Audibert, C. & Ablett, J.D. Pierre Marie Arthur Morelet (1809-1892) was an amateur scientist who devoted himself to both malacology and botany. He organised several expedi- tions, of which those to Cuba and Central America (1846-1848) and the Azores (1857) are especially noteworthy. His contributions to malacology were thus significant and we have reconstructed his legacy with a survey of archival sources and his type material in the historical collections of several museums. The resulting monograph is made up of two parts. In the first part we present a bibliography, some remarks on the whereabouts of his collection, and more than 200 recovered letters to contemporary malacolo- gists, such as, Crosse, Fischer, Baudon and Dautzenberg. His contact network has been reconstructed using data from his correspondence and his publications. This part offers an unique view into the world of malacology in the second half of the nineteenth century. In the second part a bibliography of Morelet is presented, as well as all his newly introduced taxa, with detailed documentation and figures of the species. More than 80 per cent of his type material has been re-found and original figures, if they exist, have been reproduced for the remaining species. Of the taxa represented by actual shell material, more than 150 are now figured for the first time. The book has indices for both taxonomy and persons mentioned, and is a must-have for anyone interested in non-marine taxonomy and the history of malacology. Pdf had we als lid van de NMV al ontvangen, kwaliteit van de inhoud is erg goed, druk en bindwijze van Pod veel beter dan verwacht, een lijvig boekwerk in niets te onderscheiden van een 'gewone 'uitgave, aanbevolen ! Een prachtig vormgegeven boek dat gemakkelijk leest. Een mooi totaal overzicht van alle het werk van een 19e eeuwse malacoloog met grote staat van dienst. De auteurs hebben een enorme berg werk verzet om alle door Arthur Morelet beschreven soorten, in musea of literatuur, te zoeken. Veel van deze soorten zijn in dit werk voor het eerst afgebeeld. Daarnaast omvat een groot deel van het boek vele brieven van Morelet, in chronologische volgorde weergegeven. De p.o.d.-versie van het boek is stevig, strak en uitstekend gebonden, papier vind ik van prima kwaliteit, foto's en afbeeldingen zijn mooi en scherp afgebeeld. Chapeau! 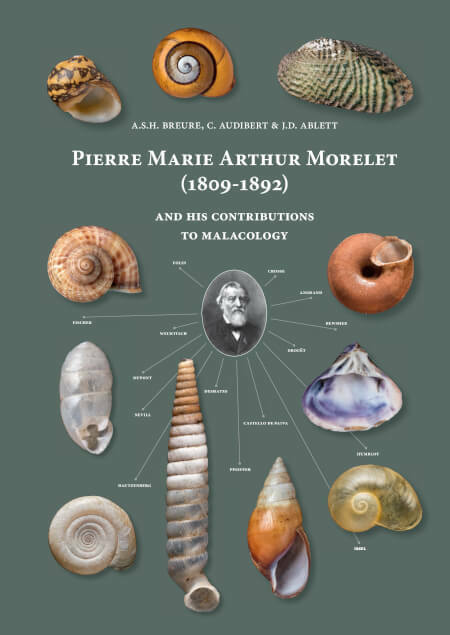 This is an excellent work on the life and scientific achievements of Arthur Morelet in the field of conchology/malacology. Morelet discovered between 1845 and 1890 more than 700 new land and freshwater snails and mussels from all over the world. For the first time all hist taxa are listed, with a bibliography, and by far the majority of his original material is photographed. Many of his species have been photographed for the first time, making identification much easier than from his drawings made more than 100 years ago.Excellent work, nice lay-out, and an important monograph that will last for decades.